The Windows 7 Command Prompt is a robust solution for administrators to quickly and easily keep a system up and running smoothly. It’s rare that the average user has a use for the Command Prompt. Rather than invite temptation, many administrators prevent access to the Command Prompt to discourage users from troubleshooting computer errors and poking around where they can compromise the integrity of a system. The Windows Command Prompt (sometimes called the DOS prompt) is a tool that allows administrators to create batch functions, troubleshoot computer errors, and invoke system-wide commands to make administration easier and more efficient. The average user has little use for this tool. The Web is filled with advice on how to fix errors on a Windows 7-based PC. Some users take it upon themselves to troubleshoot and fix their own errors rather than waiting for a professional. Some administrators make it easy on themselves and prevent user access to the Command Prompt instead of disallowing certain functions on a function-by-function basis. 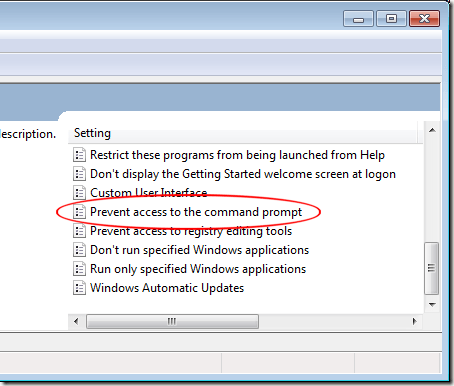 Preventing access to the Command Prompt is a quick way to ensure that users don’t go poking around in areas they shouldn’t be poking around in. 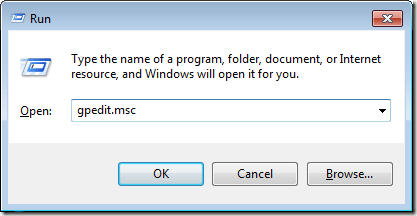 Log in to Windows 7 using an account that has administrative privileges. Click on Start>Run to open the Run dialogue box. If you don’t see the Run command on your Start menu, hold down the Windows key on your keyboard and press the R key. In the Run box, type in gpedit.msc and click the OK button. 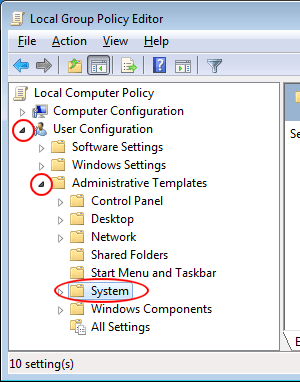 In the Local Group Policy Editor window’s left pane, open the folder located at User Configuration>Administrative Templates>System. Make sure to click on the System folder rather than expanding it. 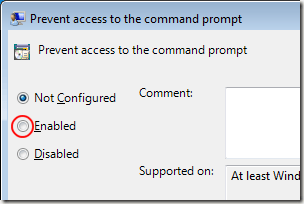 In the right hand pane, locate and double click on an entry labeled Prevent Access to the Command Prompt. 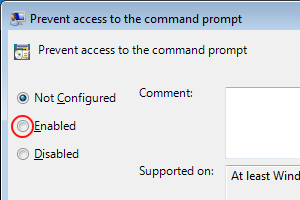 You should now be looking at the Prevent Access to the Command Prompt window. Like most installations of Windows 7, this setting should be set to the Not Configured option. Click on the Enabled option and click the OK button. Close all other open windows and you are done. You do not have to restart your computer for the setting to take effect. All users of the PC are now denied access to the Command Prompt. 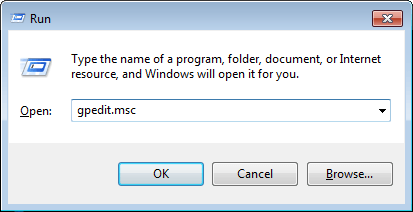 Although the Command Prompt is a useful administrative tool, few casual users of Windows 7 have use for it. Rather than deny access to features of the operating system on a function-by-function basis, many administrators prefer to prevent access to the Command Prompt by using the Local Group Policy Editor. 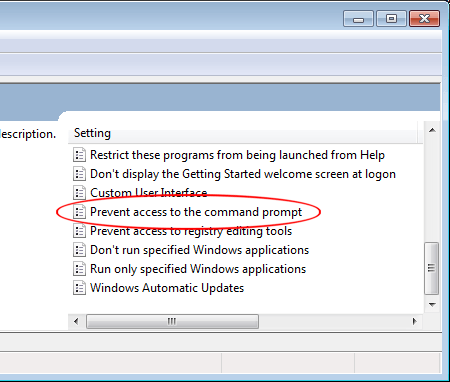 Re-enabling access to the Command Prompt for all users is as simple as following the steps outlined above and this time disabling the feature. Note that enabling the feature means that users do not have access to the Command Prompt while disabling the feature restores access. 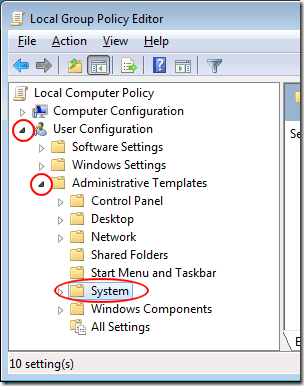 This concept can be a bit confusing if you are not used to working with Windows 7′s Group Policy Editor.